Are you a newbie runner? A veteran? No matter how long you’ve been running, you must know the importance of strengthening your core muscles. If you don’t, welcome to the club! I didn’t know either, until I injured my lower back which still prevents me from running until today. I’ve been seeing a physical therapist for over a month now, and I’m doing the following core strengthening exercises. If you are still injury-free, count yourself lucky and learn from my mistakes. Integrate these exercises into your routine to avoid having your running career (not that I had one haha) halted by injury. Pelvic Tilt. Lie on your back, knees bent, and with your feet flat on floor. Put your hands palm-down in the space between the floor and your lower back. As you exhale, flatten your lower back against the floor—you should feel the pressure on your hands. Hold for 10 seconds and go back to start. Repeat 7 times. Knee to Chest. Again, lie on your back with your legs stretched out. Interlink your hands under your thigh and pull it towards you. Make sure that the other leg remains flat on the floor. Maintain pose for 10 seconds. Lower it and do the same with the other leg. Repeat 3 times. 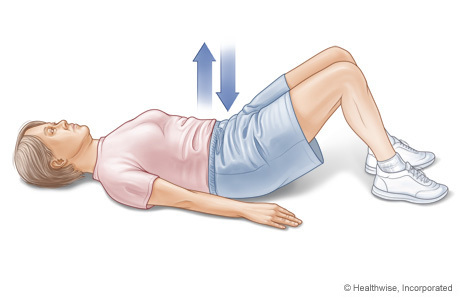 Then bring both knees—one at a time—to your chest for 10 seconds. Lower one knee at a time, and do 3 reps.
Hamstring Stretch. Lie on your back with your legs stretched out. Using a towel, pull one leg up and straighten it, with the bottom of the foot facing the ceiling. Pull down on the towel to bring your leg as close to your chest as possible, keeping it straight, until you feel the stretch in the back of your thigh. Hold for 30 seconds. Bring it down slowly and do the same with the other leg. Repeat 3 times. The Plank (a.k.a. Prone Core Bridge). Yes, this is a yoga pose, and it happens to be very good for runners. Lie face down on the floor. Slowly lift your whole body, with your upper body supported by your elbows under your shoulders and your forearms on the ground. Your body should be in a straight line from your shoulder to your feet; watch out for the sagging of your stomach. At first you may feel trembly but with practice you can easily do it. Hold for 30 seconds and repeat 3 times. Side Plank. Yes, this is another yoga pose. It’s like the plank, but only sideways. To start, lie down on your side. Lift your hips, with your weight on your forearm supporting your upper body and the side of your foot. Make sure your body is straight. Hold for 30 seconds. Do the same on the other side and repeat 3 times. These are the core strengthening exercises I do a few times a week. My PT said I should do it everyday, to strengthen my core faster. I really hope it will help me get back to running again!